Since the change of Government in 2010 we have seen the creation of the Office of Tax Simplification. Has this helped simplify tax? Not a chance – if anything we have seen an increase in complication with changes to mortgage interest tax relief on rental property, dividend tax, changes to CGT reliefs and stamp duties to name but a few. Add to this further complication of foreign income and HM Revenue & Custom crackdowns and it is clearly understandable why many individuals turn to Mollan & Co for help with completion of tax returns as well as offering tax planning advice. Landlords with buy-to-let property are taking a real hammering with changes to the tax system over the last few budgets with more pain to come. With our in-depth knowledge and experience of tax issues in relation to property portfolios, we can take the hassle out of accounts and tax compliance issues as well as ensure we give you the best advice to minimise tax. 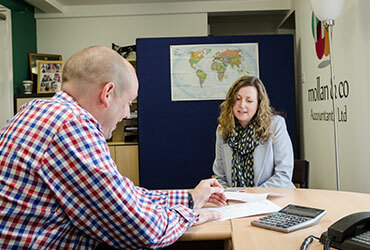 As the tax man increases the number of tax inspections we can provide the necessary help and support during this (extremely) stressful period and along with our Client Fee Protection Plan you can get piece of mind that as a client of Mollan & Co if you are selected for enquiry the costs can be minimised and therefore no reason not to have us fight your corner. To book a free initial review meeting please use our online booking tool to meet with a qualified accountant or alternatively give us a call. Mollan & Co have guided me through a complicated and stressful tax situation with ease and they made me feel completely sure about the work they were doing on my behalf. Whether in person or via email, the staff are happy to be working with and communicating with me. Mollan & Co helped me resolve my situation and saved me money. The piece of mind you get from the services and rates is a great value , especially for a small business owner like myself. Start-up advice, business plans and cash flows. Never engaged an accountant before? VAT returns, Payroll, management accounts & consultancy.